Salesforce Heroku - App Development Platform - Create amazing experiences. 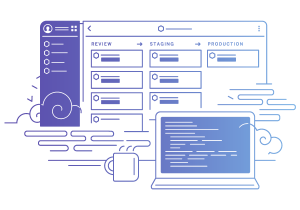 Heroku Enterprise gives you the ability to use open-source languages and frameworks like Node.js, Ruby on Rails, Django, or Spring to build that public-facing interface. Heroku is a Platform As A Service (PaaS), just like Force.com, but it’s a platform that provides different capabilities, such as support for many different programming languages and the ability to control and scale resources. Destined’s customers are using Heroku to scale their CRM meaning they can deliver instant sales and service insights to delight customers at every moment. They are building mobile and web apps on Heroku with the data flowing seamlessly back into Sales Cloud as required. Heroku is a fully managed PaaS — all the underlying complexity is handled for you by dedicated teams at Salesforce, including things like responding to failures, monitoring security vulnerabilities and patching them, planning for scaling, and actually scaling the PaaS. If you wanted to run your own PaaS, you’d need teams of people managing all these things 24/7/365. Often it is useful to hear more about how we have helped others like you. Use this form to request a call back.